1868: born in Edo in the district of Mukôjima. 1870: he was adopted by Onoe Kikugorô V.
3rd lunar month of 1871: he made his debut at the Nakamuraza, where he received the name of Onoe Kikunosuke II. June 1876: premiere at the Shintomiza of Kawatake Shinshichi II's drama "Hototogisu Date no Kikigaki"; Kikunosuke played the role of Tsuruchiyo [casting]. October 1878: premiere at the Shintomiza of Kawatake Shinshichi II's drama "Jitsugetsusei Kyôwa Seidan"; Kikunosuke played the role of the daughter of the Naniwaya Oai [casting]. June 1881: premiere at the Shintomiza of Kawatake Shinshichi II's dance-drama "Tsuchi Gumo"; Kikunosuke played the role of Kochô [casting]. November 1883: premiere at the Ichimuraza of Kawatake Mokuami's drama "Zôho Tenjiku Tokubê", a revision of Tsuruya Nanboku IV's "Tenjiku Tokubê Ikoku Banashi"; Kikunosuke played the role of the yakko Shigezô [casting]. February 1885: Kikunosuke took part in the opening ceremony of the Chitoseza [more details]. Premiere at the Chitoseza of Kawatake Mokuami's drama "Suitengû Megumi no Fukagawa"; Kikunosuke played the role of Kôbê's daughter Oyuki [casting]. March 1886: première at the Chitoseza of Kawatake Mokuami's drama "Mekura Nagaya Ume-ga-Kagatobi"; Kikunosuke played the role of Otami [casting]. 1886: quarrel with his adoptive father Onoe Kikugorô V.
February 1887: he took the name of Onoe Shôkô in Ôsaka, where he tried to give a boost to his career. September 1890: Shôkô played at the Kitaza the role of the courtesan Sumizome, in reality the spirit of Komachi's cherry tree, in the dance-drama "Tsumoru Koi Yuki no Seki no To"; the roles of Sekibê/Ôtomo no Kuronushi was played by Nakamura Shikan IV. January 1891: he went back to Tôkyô, where he became reconciled with his adoptive father Onoe Kikugorô V. He took back the name of Onoe Kikunosuke II. November 1891: the title "Oto ni Kiku Tenjiku Tokubê" was used for the first time, in Tôkyô at the Fukanoza; Kikunosuke played the role of Sasaki Katsuranosuke [casting]. January 1892: premiere at the Kabukiza of Kawatake Shinshichi III's drama "Shiobara Tasuke Ichidaiki"; Kikunosuke played the role of Hara Tanzaburô [casting]. February 1897: Kikunosuke appeared on stage for the last time, in Tôkyô at the Kabukiza, playing the roles of Nishikawa Sôzaburô, Nishio Kazuenosuke and Oshizu in the drama "Gojûsan Tsugi Ôgi no Shukuzuke". He also played the role of Ono no Komachi in the dance-drama "Tsumoru Koi Yuki no Seki no To". His stage partners in this dance were Onoe Kikugorô V (Sumizome, the spirit of Komachi's cherry tree), Ichikawa Danjûrô IX (Sekibê/Ôtomo no Kuronushi) and Ichikawa Somegorô IV (Yoshimine Munesada). 28 June 1897: Kikunosuke died in Tôkyô; his tombstone was located in the precinct of the Daiunji Temple in the district of Oshiage. 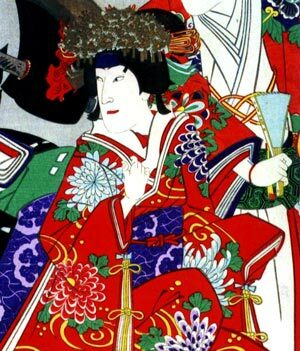 Onoe Kikunosuke II was a promising actor of the Otowaya guild, who unfortunately died at the end of his 20s. His life was dramatized in the novel "Zangiku Monogatari" (literally "Late Chrysanthemums"). In this story written by Muramatsu Shôfû, Kikunosuke was openly praised for his stage performances, only because he was his father's heir. Otoku, the wet-nurse of his brother, was the only one to be sincere enough to tell Kikunosuke the truth about his performances but she also had faith in his talent. Kikunosuke fell in love with her, but the possible mesalliance provoked the wrath of his adoptive father Onoe Kikugorô V. Kikunosuke left the Onoe clan to try to become an accomplished actor by himself in Ôsaka, where he struggled for a long time. Thanks to the help of Otoku, he finally became a famous actor and regained the recognition of his adoptive father. This novel became a theatre hit (screenplay written by Iwaya San'ichi) and a movie masterpiece, directed in 1939 by Mizoguchi Kenji.